That said, however, the dismal ranking still stands in regards to science education. “What can I do about it?” I hear you asking, but fear not, here is a suggestion regarding what you can do to help Mississippi raise its ranking. One thing you can do to help in this situation: Go to travelling science exhibitions such as Titanoboa (the largest snake that ever existed) at the Mississippi Museum of Natural Science to encourage your scientific curiosity. 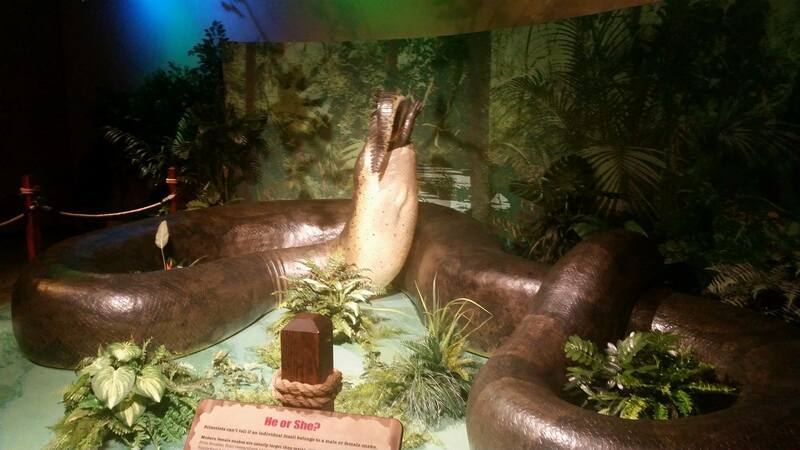 In the travelling exhibition at the MMNS, the Titanoboa exhibit not only displays a life-sized reconstruction of the snake, (which is pretty damn impressive to look at!) but also provides a size comparison between the vertebrae of a Green Anaconda and the Titanoboa as a means for comprehending just how massive this animal was. I want to commend the Mississippi Museum of Natural Science for bringing in exhibits that explore these concepts and try to get the public interested in them. By bringing this landmark exhibition (produced by the Smithsonian no less!) to Jackson, perhaps the spark of scientific interest of the younger generations, as well as some of the older ones, could help Mississippi climb up the ladder of science education ranking? But back to science and the State of Mississippi. Because Mississippi ranks so low in regards to science and how it is taught in classrooms, perhaps a change to the methods by which science and controversial topics are taught is in order? If you decide to engage in my suggested plan for increasing and bettering scientific education in Mississippi, who knows what you might learn? For example, if you went to the Mississippi Museum of Natural Science, you could find yourself learning about the evolution of life on earth, prehistoric fish, and the various ecosystems in Mississippi. If you took a field trip during geology classes, you could learn about different soil and rock types and how they can determine the environment around them. If the younger generations become more interested in science and controversial topics such as evolution, human evolution included, perhaps they could be the way to better rankings for Mississippi concerning sciences. By instilling this scientific curiosity in the younglings, Mississippi might have a way to reach science education levels found in the rest of the country and thus not be viewed with scorn or viewed as a laughingstock in these matters. As a student and as an educator in Georgia, I agree that the educational system of many areas in the deep South is lacking. Much of this has to do with poverty rates. Children of poverty are often not given the resources they need to succeed. Sometimes the only hot meal that these children get during the day is their school lunch. It is hard to reach children at times, especially when they are going hungry or are worried about their home life. It is up to us to help provide these children with the resources and motivation to help them succeed. Thank you for sharing this, Jeremy.